Problem with wireless adapter or access point. As the statement of the error suggests, the issue would be with the receiving hardware on the system or the router itself. It could also be with the drivers and services in the system. Before anything else, check if other devices connected to the internet through the router are able to access the internet properly or not. If yes, the router itself might be fine, the problem could be with your system. 2] Type the command ipconfig and press Enter. It would display a set of information. 3] From the set of information, check the value of the IPv4 address. If it is 169.254.***. 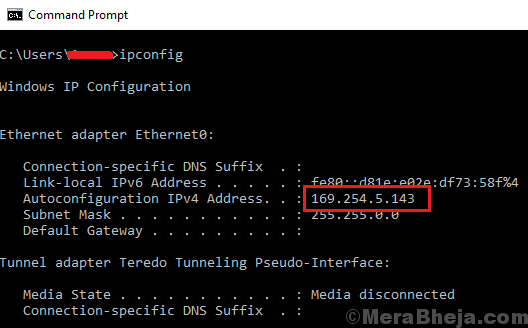 *** something, it indicates a condition called APIPA where the system assigns itself an IP address. 4] To resolve the condition, we would have to power-cycle the modem-router-computer. Switch OFF all the 3 devices. Wait till all lights are up and stable. Then switch ON the ROUTER. Finally, boot your system and check if it able to connect to the network. You could try connecting your system to the network hard wired to update the drivers. If that doesn’t work either, we could still uninstall the current drivers and restart the system to reinstall them. Here is the procedure to update the drivers in Windows 10. In case the drivers you need have to be downloaded from the internet and you are totally unable to connect to the network by either means, you could download the drivers from Intel’s downloadcenter and transfer it to the system using a USB drive or something. The drivers could also be downloaded from the manufacturer’s website. Many users have reported that the issue occurs while using the free version of McAfee anti virus. It might be the case with other anti virus programs as well. Disable your anti virus program temporarily to isolate the issue. Check if it helps with network connectivity. 2] In the list of services which is ordered alphabetically, locate the IP helper service. 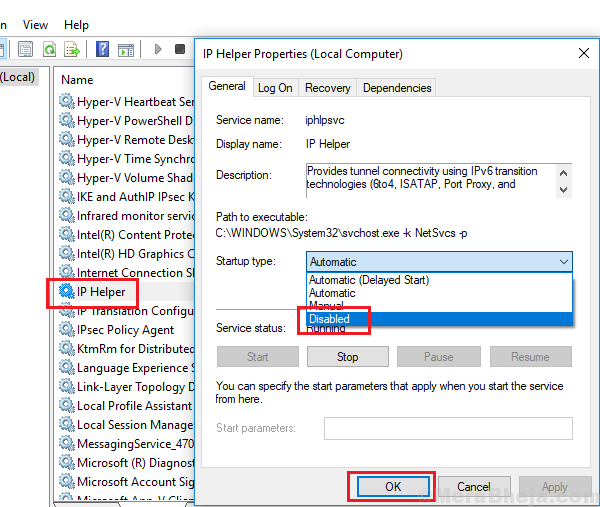 3] Right-click on the service and select Properties. 4] Change the Startup type to Disabled. Apply and save the settings. Where WirelessProfileName is whatever name you wish to give to the new wireless profile.